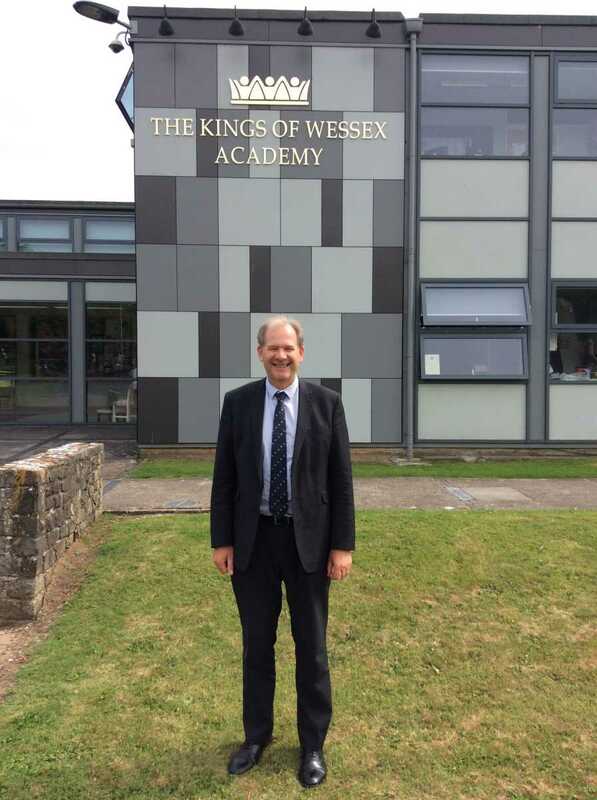 As part of his retirement celebration and reflections on nearly 23 years of headship, Sam Kail-Dyke and Joe Maggs of The Kings and Queens News Team interviewed Executive Headteacher Mr Richardson for the final Headteacher Questions and this is what they found out. 1) How are you feeling about retirement? It’s fair to say that I’m feeling somewhat apprehensive about my retirement! Whilst I’m looking forward to it, I’m sad that I’m going to be leaving behind such a good school with good people. Also, I’ve been in education since I was five years old; so I feel somewhat ill-equipped to face the world of retirement! 2) What are your plans for retirement? I think life is a finite journey, and it’s a realisation that I have lots of things that I want to do with my life, like seeing the world through travelling and I know I need time to do that! 3) What has changed during your time in education? In essence, I would say the students haven’t changed. What is essential is that all students are individuals – unique and special – regardless of time. But what has changed are two things: first of all, now young people are very tech-savvy, very connected in a way that they weren’t when I first started. Secondly, young people today are much more conscious about being ‘global citizens’, in a way that perhaps they weren’t in the past. I expect this is a product of the IT revolution that allows them to see and experience the whole spectrum of our society, country and world as a whole. By and large I feel this is a positive change. 4) What has been your high point at Kings? I’ve been at Kings for 22 and a half years, and whilst I don’t have a single ‘high point’, I do have many. An important one was achieving our aspiration to remodel and rebuild completely much of the campus, so that it’s fit for the 21st century, is definitely one of them. For instance the new English and Maths block, the LRC extension, the revamped Science block, a new Languages block, the Kings Theatre and of course, the Kings Café. In fact, we’ve essentially remodelled the whole school! Other high points include being one of the first rural schools in the country to achieve Specialist School status, providing us with more money to invest in Science and Technology. Moreover, becoming an Academy and establishing the Wessex Learning Trust has also been very exciting, linking local schools and the education process between the ages of two and 18. For me personally, it was an honour to visit 10 Downing Street whilst David Cameron was Prime Minister, as well as my sabbatical to the University of Cambridge. 5) Have there been any amusing moments? There have certainly been some amusing points, such as coming into school and being informed by the Head of Sixth Form that there was a sheep in the staff room! 6) What lessons have you learned? The lesson I’ve probably learned over all this time is to never give up, because I genuinely believe that the children who come here have one chance, and it’s important that we do all we can to give them the very best chance in life and help them achieve their potential. I feel just as passionately today about the students in this school and their future as I did the day I started. Another lesson has to be to cherish what’s important to you in life. In the context of school life, it’s not about the buildings or the curriculum, but the interaction that we all have with each other, which I feel is what makes Kings so special. We’ve got fantastic staff, a great community wanting to help us, and we’re a team that work together, mutually supporting each other, and that enables us to achieve much greater things than as an individual. 7) How do you see the future for Kings? I’m very proud of Kings, and I think that Mr Ball is a good appointment. He’s an experienced Headteacher with a good track record, and shares our values and aspirations as a school. He’s very keen to get to know the school and equally, he wants to build on where we are at the moment. So I hope that the school will continue to flourish as a beacon of excellence, and will continue to champion children and their futures, putting them at the heart of what we do. I also hope that it will nurture and grow our staff, as they are fantastic people that do a brilliant job. Also, I hope that the school will take opportunities as they arise along the way. It will be good to see the Wessex Learning Trust grow and support schools where maybe they are struggling in certain areas. However, most of all it’s for others to chart the future of the school and I feel very confident that the school is in great hands, because of the staff and students here who are the custodians of the future of the school. 8) What do you think about the current education system? I believe that education is going through an interesting moment in time. Politically, the country is very split, and some of the education reforms that I believed might have been potentially damaging have been shelved, which is good to see. I suspect we’re going into a period of relative stability compared to what we’ve had with perhaps not as much change from Central Government, due to the obvious preoccupation with Brexit. Moreover, since there is a minority Government, there will need to be more of a consensus moving forward. I believe that the announcement on increased funding in schools is a good start, but we need to continue to invest in our children and schools to undo damage done. New GCSEs and Levels are continuing to be introduced, which will also be good to see. I’m interested to see what will happen with student university fees. I think they’re exorbitant as it stands and the interest rate is punitive, which I feel must change, without effecting the number of students who go to university. Anyone who claims there will be no fees, must also be asked how many places there will be. If we have no fees, do we want fewer places? I also believe that we’ll see a growth in apprenticeships, and more technical paths for students. It will be great to see a growth in this area. 9) What is still on your wish list to do at Kings? I wish we had been able to refurbish the Business Studies and Photography block, as well as getting the AstroTurf in place, which is still ongoing. But we’ve had some delays with planning permission. It will still happen, however! 10) If you had had another career, what would it be? I would most definitely still go into education! I couldn’t think of a more rewarding and more fulfilling job. I consider myself privileged to have been in education so long, and have loved every minute of it. This job is about changing people’s lives, and teachers change and shape the lives in children in ways they will never know. Teachers are special people in our society, and they deserve much more praise than they get. Interestingly for me, it all started because I was in Lower Sixth, and a teacher said to me: “I think you’d make a good teacher, would you like to go onto a course run by Leeds University regarding teaching?” I did, and I have Mr Digby to thank for this wonderful career I’ve had and I’m still in touch with two people that went on that course, and they’ve both just retired as well. 11) What are your plans for retirement? My plans are at heart because I’m a Geographer. I think we live in an amazing, diverse and varied world, and yet I’ve only seen a small part of it. I want to see so much more of it! Travelling the world is going to be one of my ambitions. Another ambition is that I love walking, specifically in upland areas, and I want to have time to do more walking, including long distance footpaths. I enjoy gardening, so I want to spend more time in my garden, as well as writing, so I’d like more time to write! I’ve been writing a book, and I’d like to finish that and publish it, and of course I want to spend more time with those close to me. I’ve had lots of job offers, but as of yet I’ve turned them down. 12) What advice would you give to your successor? The advice I’d give to my successor is to cherish and nurture Kings, be aspirant for students and staff, and of course, try your best. 13) What will you do on your first day of retirement? The first thing I’ll do on my proper day of retirement will be to get up late, read the newspaper, enjoy a leisurely breakfast, and go for a long walk. Of course, I’ll look back with great fondness at my time at Kings, which I will of course never forget. Thank you Mr Richardson and we wish you a long and happy retirement.